This article in the Waltham Forest Echo is entitled More Misery For Rail Passengers. The article describes how yet again the Gospel Oak to Barking Line will be closed for two months to complete the electrification. This is said. The next closure, to finally complete the work, will now commence from 6.30pm on Saturday 18th November, with trains not running again until Sunday 14th January. Staff from Network Rail, Transport for London and Arriva Rail London, the operator of London Overground, will be available to answer passengers’ questions on Wednesday 1st November at Blackhorse Road and Walthamstow Queen’s Road stations, and on Thursday 2nd November at Leytonstone High Road Station. It is a downright disgrace and on past form, I doubt it will be the last closure. It looks like the electrification will be delivered about a year later than planned! By any standards that it is not good project management. This is a random set of pictures from along the Gospel Oak to Barking Line. Note the the electrification is not complete. Sections still to be wired include. East of Walthamstow Queen’s Road station. The link To The Midland Main Line At Carlton Road Junction. The Harringay Curve that links to the East Coast Main Line. At least most of the gantries seem to have been erected. According to TfL’s closure list, there is four partial weekend closures planned. Let’s hope that finishes the electrification. I suspect the two links, which are for freight and empty stock movements can be fitted in without any closures. The title of this post is the same as an article on Rail Technology Magazine. Network Rail has this week confirmed that the GOBLIN electrification project is expected to be completed in January 2018 ahead of new trains arriving in spring. I do wonder if there would have been a better way. This article in Rail Magazine, which is entitled Flex… and flexibility and consists of an interview with Helen Simpson and Mark Isbern of Porterbrook. It gives lots of clues to the thinking behind the Class 319 Fklex train. This article on the Islington Gazette details the further closures on the Gospel Oak to Barking Line. This is said. I know the electrification needs to be completed, but the engineers and planners of this job, have not exactly covered themselves in glory. Compare this project with the one a few miles away, where Volker Fitzpatrick are rebuilding Hackney Wick station, which seems to have gone a lot smoother, despite I would suspect being a much more challenging project. Several mistakes would appear to have been made on the electrification and I hope the companies and individuals involved will be properly names and shamed. Are Transport for London Reorganising Train Deliveries? In the May 5th Newsletter of the Barking – Gospel Oak Rail Users Group, this is said. It is now looking increasingly likely that the first of our new 4-carriage electric trains will arrive around the turn of the year and be diverted to another London Overground service because Barking – Gospel Oak is still without energised overhead wires. The first 14 of the new trains (Class 710/2) were due to be shared between the Barking – Gospel Oak and Euston – Watford Junction services, the remainder (Class 710/1) going to Romford – Upminster and Liverpool Street – Cheshunt/Chingford/Enfield Town services. It has been said in a couple of places, that to get electrified freight trains through North London, whilst the hiatus at Hackney Wick station was taking place, needed to get the wires on the Gospel Oak to Barking Line (GOBlin) switched on as soon as possible. Now it appears that the electrification won’t be available this year. I think that Transport for London may be rescheduling how the trains are delivered. I would perhaps introduce the new Class 710 trains like this. Note that there are two types of Class 710 Trains. 14 x 710/2 for Watford DC Line and GOBlin – Dual Voltage – stabled at Willesden. Could this be TfL’s strategy? Put a 710/1 on Romford to Upminster Line for initial testing and driver training. Replace trains on Cheshunt and Chingford services to bed in the new Class 710/1 trains. Replace Watford DC Line trains with new Class 710/2 trains. Cascade the current Watford DC Line Class 378 trains to the North and East London Lines as planned to boost services. Check out all Class 710/2 trains for the GOBlin by running on the Watford DC Line. Finish the electrification on the GOBlin, whilst running services with the current Class 172 trains. When the GOBlin electrification tests successfully, introduce the Class 710/2 trains. Cascade the Class 172 trains. I think this strategy is low-risk and has the following advantages. Romford/Upminster with its need for just a single train would surely be an ideal line for initial testing and driver testing. Cheshunt, Chingford and Watford DC services, shouldn’t be particularly difficult lines on which to replace one electric train with another. The Class 378 trains from the Watford DC services would be available to boost Stratford to Gospel Oak services before electric trains run between Barking and Gospel Oak. The dual-voltage Class 7810/2 trains will be fully tested on the Watford DC Line before any deplayment on the Goblin. The Class 172 trains would only be cascaded, when TfL have accepted the GOBlin and its new Class 710/2 trains. But provided the track of the Gospel Oak to Barking Line is usable, the Class 172 trains and diesel-hauled freight will always get through. The Gospel Oak to Barking Line reopened after its major upgrade on Monday. Gantries – Some overhead gantries have not been erected. Lifts – Some stations need lifts. Ticket Gates – Ticket gates might need to be installed at some stations. Wires – Wires need to be installed. These are some pictures I have taken along the line. Barking station is more or less complete. Note the unique step-free double cross-platform interchange to Gospel Oak and c2c services. Woodgrange Park station is more or less complete. Note the excellent refuges enclosing the new ticket gates. Wanstead Park station needs a fair bit of work. Leytonstone High Road station needs a fair bit of work. The station’s brickwork has been sympathetically restored. Leyton Midland Road station needs a fair bit of work. I’ve used the station many times and the builders had done a very good job in improving the station with imaginative use of brickwork. Walthamstow Queens Road station is more or less complete. I think adding lifts is going to be difficult, but aren’t strictly necessary due to the long ramps. Blackhorse Road station is more or less complete . South Tottenham station is more or less complete. At Harringay Green Lanes station needs a fair bit of work. Crouch Hill station needs a fair bit of work. There might also be a serious problem with not enough clearance under the station bridge. Upper Holloay station needs a fair bit of work. Gospel Oak station is more or less complete. I was glad to see the coffee hut hat been reinstated. Speaking to other passengers, all seemed pleased that the line was back in service and a couple remarked how neat and tidy it all was. No-one seemed to be bothered work was still ongoing. I even got praise for the Class 172 trains, which will be replaced by new Class 710 trains in 2018. One guy said there’s no need, although when I told him, they will be bigger, he liked that. Are Murphy Group Playing A Long Game? 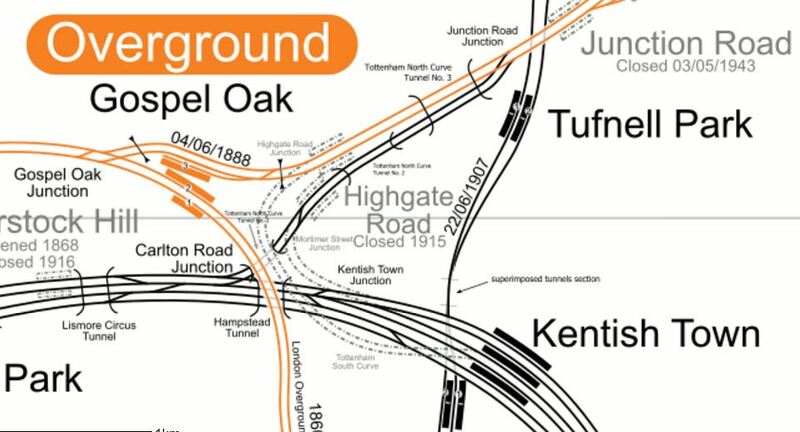 This news release on the Murphy Group web site is entitled Murphy Wins £60M+ London Overground Electrification Project. Given, that it was known to be a difficult project, I don’t think I am alone in thinking that Murphy’s contract price was good value for London Overground. Since then, progress has not been at a fast pace and some challenging problems seem to have emerged, but on whole professional commentators in magazines like Modern Railways an Rail Engineer have been broadly praising of the way the work is being done and what has so far been finished. The troubles on the Holloway Road Bridge, which is not in Murphy’s contract, that I wrote about in Did The Project Management Go Wrong On The Holloway Road Bridge?, can’t have helped either. I do wonder though, if the Murphy Group could be a beneficiary of the successful electrification of the Gospel Oak to Barking Line (GOBlin). 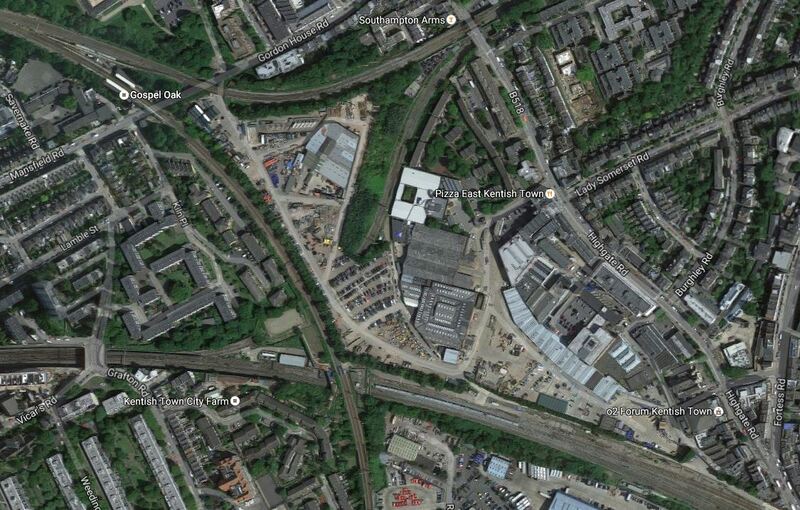 This Google Map shows the area between Gospel Oak and Kentish Town stations. Gospel Oak station in the top left, where the GOBlin meets the North London Line. The Midland Main Line curves across the bottom of the map, with Kentish Town station, just off the bottom right corner. There is another rail line (Tottenham North Curve ?) connecting the GOBlin to the Midland Main Line, that is current used by freight trains. Between all these lines is a massive builders yard, which is the home of the Murphy Group. In some ways giving the Murphy Group, the contract for the GOBlin upgrade and electrification, is like giving your local builder, the job of upgrading your house. The Murphy Group have even accessed some parts of the work, by putting gates in the security fence between the railway and their yard. This map from carto.metro.free.fr, shows the railway lines in the are. It shows how at times in the past, the rail connections from this area, were some of the most comprehensive in London. There are already plans for some of the railways in the area. The Tottenham North Curve from Carlton Road Junction to Junction Road Junction is being electrified, so that electric-hauled freight trains can run between Barking and the Midland Main Line. Passenger services could be introduced on the Tottenham North Curve to create a second route across North London, linking Barking and Acton via West Hampstead Thameslink and the Dudding Hill Line. Could we even see a re-opened Highgate Road station? I have a feeling, that all this, together with London’s enormous need for new housing will see the Murphy Group site developed, in a manner that is best for London. And the Murphy Group! The development will have very good transport links. A reopened Highgate Road station, would be in the middle of the development. The development site is occupied by largely one company. The site is well-connected to railways for the transport of building materials and spoil. The site could be developed gradually, as the Murphy Group released the space. Probably, the biggest problem would be finding the Murphy Group a new site. It will be very interesting to see what happens on this very valuable site! Don’t knock it, but the sun ruined some of these pictures. I’m only one metre seventy, so taking pictures over a high bridge parapet iis not easy. Shrubland, Albert and Queen’s Roads are respectively Bridges 68. 69 and 70. From Bridge 70, you can get good views of the slab track. East of Bridge 70, there is extensive piling, that probably stabilises the cutting. East of Queen’s Road station, there was little evidence of overhead gantries. There appeared to be work going on at the Eastern end of the slab track, where the viaduct starts. It looks to me, that there is still a lot of work to do and the planned reopening as a diesel-powered railway in February, that I wrote about in The Gospel Oak To Barking Line Is Planned To Reopen On February 6th 2017, must be in doubt. Unless of course, all that the closure is intended to do, is get the track, bridges and viaducts, in tip-top condition for the actual electrification. It should be that the design of slab track used, is one that facilitates easy repairs if anything goes wrong. These pictures show the Gospel Oak to Barking Line through Walthamstow. It looks like both tracks have been mostly relaid. The slab track under Pretoria Avenue, where it was put in due to a sewer being beneath the bridge. There is also slab track at the other end of this section of line, but I suspect, it’s covered with ballast. 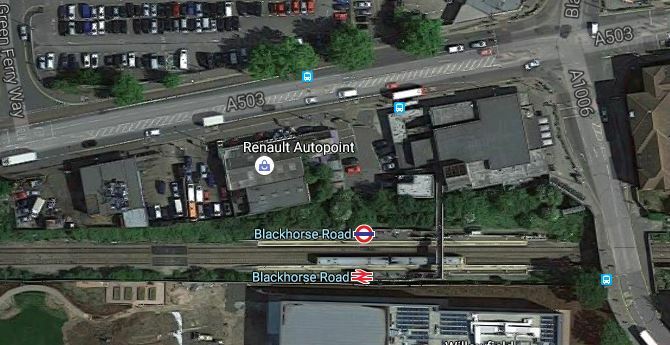 From what I could see at Blackhorse Road station, there doesn’t appear to be any foundations for lift towers or ramps to create step-free access to the Overground platforms. On Network Rail’s Access for All list of improvements. the improvements at Blackhorse Road station are listed as Future Planned for 2017/2018. As the new Class 710 trains will start running in 2018, surely it would be good planning to at least do all the work needed on the Overground platforms now! Or is there some rule, which says that when you make one line at a station step-free for all, you must do that for all lines? It is interesting to look at this Google Map of the station. The Victoria Line station is the square building to the North East of the obvious GOBlin station, with the space between the stations being just grass and some bushes. In one of the pictures, there is a lot of work going on in this area. Could it be, that there is a route to create a lift shaft from somewhere in this area, that goes both down to the Victoria Line and on the surface connects to the ticket hall and the bridge over the GOBlin? It could also be work associated with a new chiller described in this article on the TfL web site., which is entitled Innovative new fan chiller to help customers beat the heat. If you look inside the station, you’ll see that the escalators down to the Victoria Line platforms, start just to the West of the bridge over the Overground. Without more information, it’s difficult to work out what is happening. But it would surely be a good idea to do all the work at the same time and get the station step-free before the GOBlin starts running electric trains.